It's been a relatively quiet end of the year here on Fix Feast Flair and for that I'm sorry. I've done a terrible job of keeping you up to date on my many fantasy football failings. For the record, I am currently battling for 11th place of 12. So there's that. I haven't told you about the five hundred million cute things Vienna has done over the last few months. I still haven't caught you up on one of the coolest experiences of my life, which was hanging in Copper River Salmon territory with a bunch of awesome bloggers. And I've told you little to nothing about the rest of my life. We started off December in Kaua'i, eating our way through a few towns, taking in the sites, and really doing very little else other than relaxing. 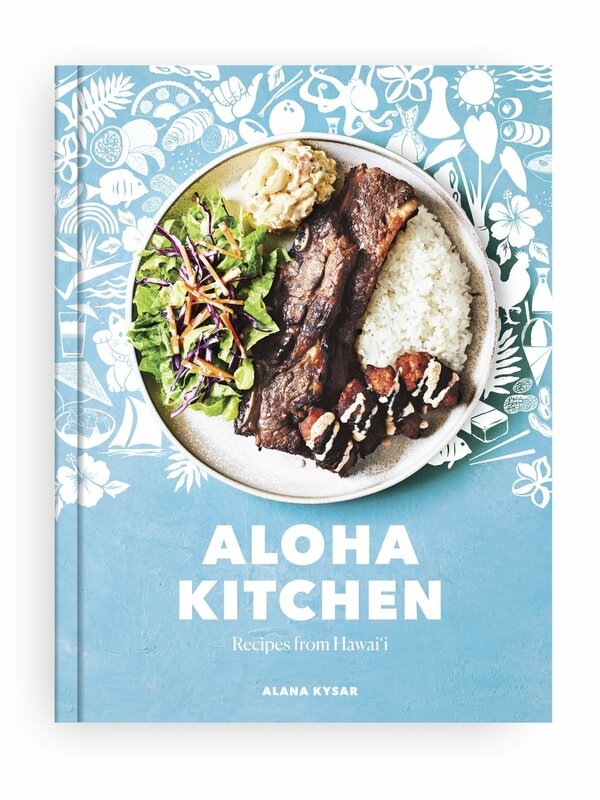 After that, I came back and focused on developing more recipes for the cookbook that I've told you very little about, and yes, I'm beginning to see a trend here. And here we are deep in holiday season and I've shared almost nothing that will help you get through these busy weeks. So, today, I'm breaking this year's trend, to share this very quick and stupid easy cheeseboard. 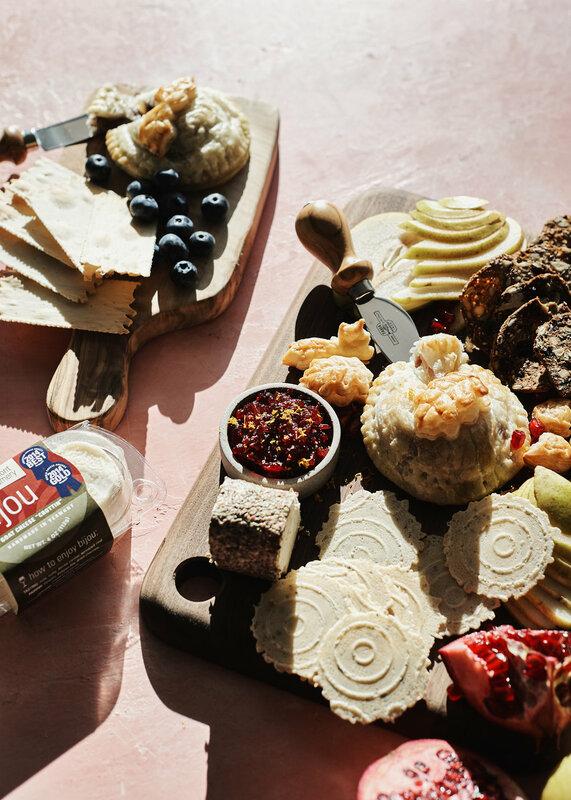 This board features one of my all-time favorite Vermont Creamery cheeses: bijou! Cuter than cute, these aged goat cheese crottin are the perfect little rounds to enclose in tiny puffed pastry pouches with your favorite preserves, bake up in a hot oven (400°F), and serve with your favorite fixings. Talk about a crowd pleaser, baked brie, or in this case baked bijou, was made for the holidays. It's warm and melty and sweet and savory all rolled up into one. And I meant it when I said it's easy to make, which, let's be honest, is what all holiday dishes should be, easy. To make them, start by taking your puff pastry out of the freezer the night before you wanna use it and place it in the fridge. Easy. Next, unwrap it and place one of the two sheets (if your puff pastry is just one long piece, simply cut it in half) on a clean work surface. Slice off the very top of your bijou round, or cremont if you want to go bigger, and throw a big old dollop of your favorite preserve on top of it. You want to generously cover the top of that round, so don't skimp! If you're going bijou, do this with all your rounds, giving at least two to three inches of space between each. Brush a ring of egg wash (make this by whisking one egg with a teaspoon of water) around the round(s) onto the bottom sheet with a pastry brush. After that, simply take your other sheet of puff pastry and cover the round(s)! I cut my sheet into four pieces to make it easier to do this next part, which is to press that first sheet all around your cheese round and onto that bottom sheet. The egg wash that you brushed on works like a glue to bind the two layers together. Cut about a half inch border around the round and then crimp all the edges together using a fork. You can cut the rest of the puff pastry scraps into cute shapes to serve up on your board. Brush the top of the enclosed bijou with more egg wash and do the same for the cute cut up scraps and place them all on a baking sheet lined with parchment. Bake for 20 minutes or until the puff pastry is golden brown. 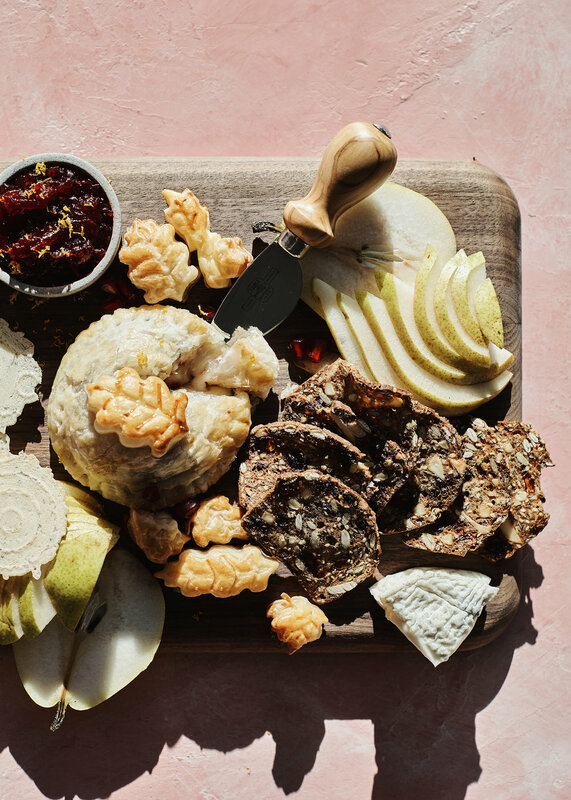 To make mini boards out of it, grab some crackers, fresh fruit, extra preserves, a few other cheese options, maybe some nuts, and arrange on a few boards. Serve immediately and get ready for lots of oooohs and ahhhhs. Happy holidays, friends! I can't wait to chat more in the new year! Preheat the oven to 400°F. Set a rack in the middle of the oven. Take one sheet of defrosted puff pastry and place on a clean work surface. 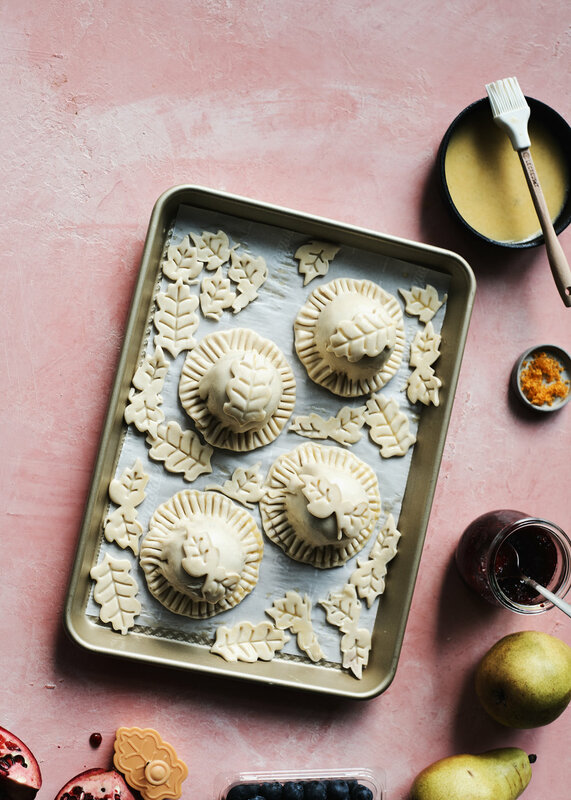 Slice off the tops of your bijou or cremont and place on the sheet of puff pastry, leaving 2-3 inches of space on all sides. Top each round with a generous dollop of preserves, covering the entire top of each round. Brush a ring around the cheese rounds on the puff pastry. Cut the second piece of puff pastry into either 4 or 2 equal sized pieces (depending on the cheese you use), and cover each cheese round with a piece of puff pastry, pressing down at the bottom to secure the top piece to the bottom piece. Use your hands to guide the pastry around the cheese, so that it's fitted snugly. Cut about a 1/2-inch border around the rounds using a round cutter or a sharp knife. Next, use a fork to crimp the edges together. Brush the tops of the rounds with egg wash. Cut the scraps of puff pastry into cute pieces and brush with egg wash.
Place everything on a parchment-lined baking sheet and bake for 20-25 minutes or until the pastry is golden brown. 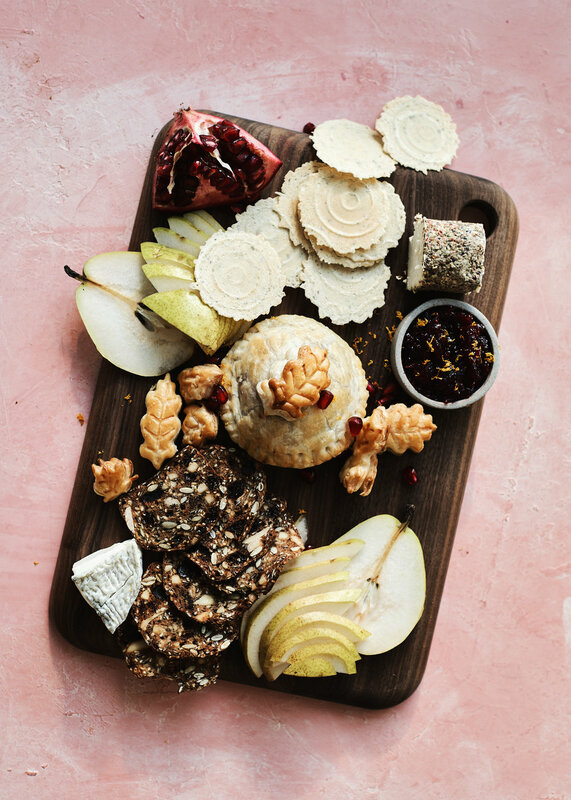 To assemble boards, place the rounds of baked bijou or baked cremont on a couple boards and arrange preserves, crackers, nuts, extra cheeses, and fresh fruits around them. Serve immediately! This post was sponsored by Vermont Creamery. 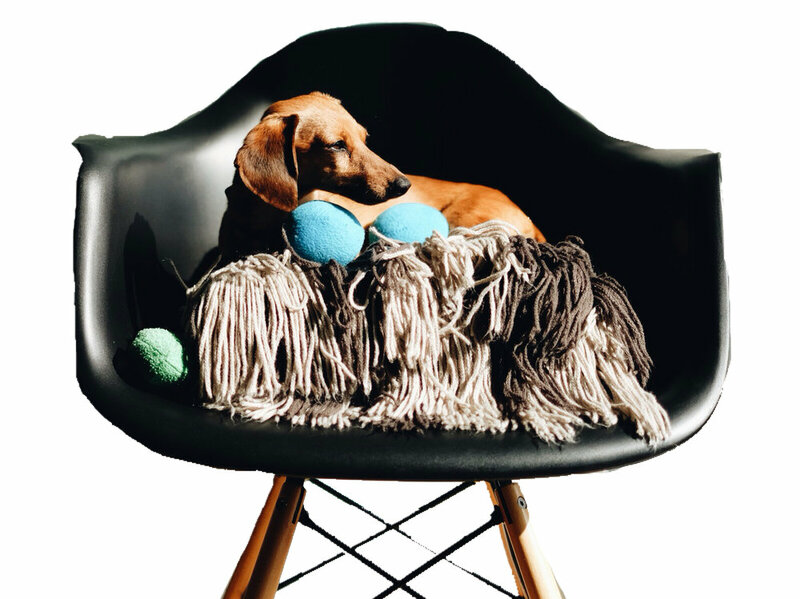 As always, a huge thank you to the brands who make this blog possible. I am a huge fan of everything Vermont Creamery makes and it was a pleasure working on this post with them! You can find their cheeses here!